For thousands of years ago, the explorers might have dreamed of unlocking the hidden secrets of ancient Egyptians. From invading the inner hidden chambers of pyramids to discovering the lost tombs buried underneath the desert sand, the valuable treasures and historical relics have always been unearthed by the explorers time and time again. This time who knows what secret mysteries players might uncover if they find their way into the secret chamber that no man has a view in millennia? It’s the spirit of exploration which is at heart of the Treasure of Horus empowered by Iron Dog Studios. This new slot may be designed in a classic manner, but when it comes to bonus offerings, it has a lot more in the store for those who take the deep dive into the gameplay. 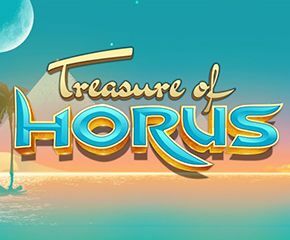 Search For Treasure In Treasure Of Horus! Treasure of Horus slots is designed with 5 reels, 3 rows and 20 fixed paylines. A tiny, slowly rotating pyramid float at top of the reels that are bordered by 2 decorated pillars, while the palm trees swing in warm breeze at its backdrop. The players can play this slot game with a minimum value of £0.05 and a maximum value of £10.00 per spin. There are 4 high-value icons including a crossed swords, Ankh, the pile of coins, a cat god and the statue of Bastet; whereas, playing cards represents lower values. The wild icon of Treasure of Horus is the blue scarab that can replace all icons to form winning combos except for scatter and the free spin icons. Anubis Chamber – rewards 6 free-spins with green scarab wild. The Special icon on reel 3 triggers next chamber. Tomb of Weret – rewards 6 free spins with pink and green scarab, (2x-multiplier) wilds. The special icon on reel 3 triggers next chamber. Tomb of Horus – rewards 6 free spins with pink, green (2x multiplier) and the blue (5x- multiplier) extra scatter symbol + wilds. 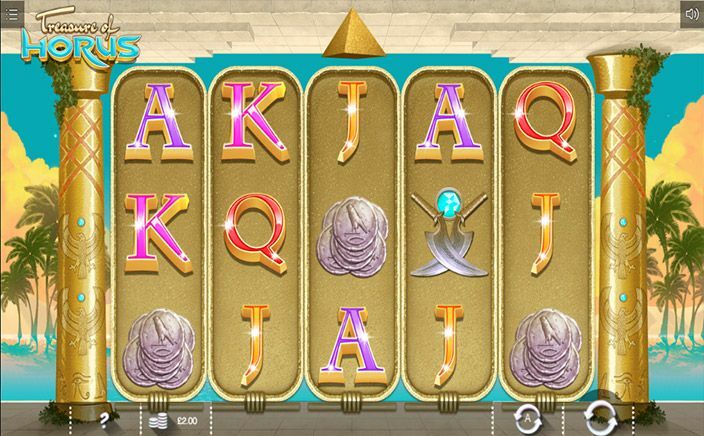 Treasure of Horus slots is a commendable work by Iron Dog Studios. This slot game has a smooth gameplay with quite entertaining bonus features. You can expect an RTP of 96.05% from this slot.